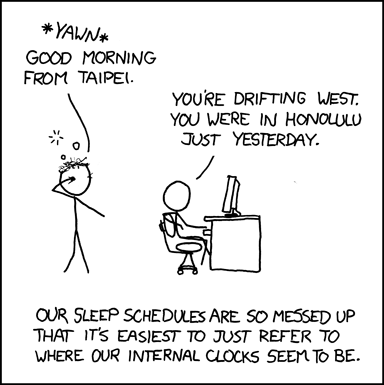 Now, as for me, is my body clock east or west of where I live??? New look… new post… new name… renewed focus…….. I don’t like the way my blogs have been becoming lately. So I’m making a fresh start… thankful for and learning from the past, and setting off once more. Lots has been changing lately. I’m coming to an end of my year on CU committee… it has been a fantastic experience, full of struggles and joys, challenges and banter… I’m really going to miss it. But, time moves on, and my time there is done. I am thankful for what has been, and will continue to learn from it for a long time to come, I’m sure. And new challenges wait ahead – currently I’m set to get more involved with Exodus (a discipleship and evangelistic organisation here in Northern Ireland) in heading up their visuals team at the new centre in Lisburn. New look, new name. Renewed focus. Hope – I feel I have been led here. Certainly one or two of my more recent posts have been heading in this direction. My faith, at this time, is about hope. Hope and love, and striving after both. And now these three remain: faith, hope, and love. And the greatest of these is love. Needless to say, this got my thinking the same question about myself… am I anybody’s favourite person? I mean, even now, while I think about it, part of me doesn’t think it’s important, but part of me does… Thinking about it, out of my whole life, all the people I’ve met and interacted with, would I actually be anybody’s favourite person? I’ve just caught myself on before I go and list things about myself negatively… that isn’t what this is about. I like myself, most of the time. Yes, there are things about myself I’m not happy with. Yes, I’ve made a LOT of mistakes in the past. Yes, I’ve hurt a lot of people. But I’m also fairly confident I’ve had a good impact on people too. And I also happen to like who God is shaping me to be. All that being said, I still can’t think of anybody that would see me as their favourite person. But thinking more about it (seeing as I’m writing this blog less than 5 minutes after I viewed those videos) I don’t think it actually matters. Sure, I may not be anybody’s favourite person… does that mean I should stop being who I am? Does that mean I should stop trying to love people as God loves them? Does that mean I’ve failed? No, I don’t think it does… I think it means that I can’t see the impact I have made on people. The reason I don’t think I’m anyone’s favourite person is because I can’t think of anyone who I have made a positive enough impact on the life of, that they would call me their favourite person. Take, for instance, me thinking of MY favourite person… Taking into account all of my life, all my experiences… I honestly can’t narrow it down to one person. There are favourite people dotted along the way, people who have been major influences and favourites at different stages and different times… even thinking about right now, over the past year… even thinking about the course of a DAY, favourite people can change, as new experoences are made and people are used in your life for certain experiences at certain times… some people make an impact, and then fade away into the recesses of memory. That doesn’t make the impact they had on me any less significant, any less important. Doesn’t make them any less of a favourite. Some people have just always been there, helping me grow, teaching me things, laughing and crying with me, sharing the banter and the struggles… they are all favourites in their own right. Some people are new, and who knows what time holds… but experiences are shared, and new favourites are born, joining the ranks of the hundreds already present. So in conclusion, for this has indeed been a somewhat unorganised ramble through my thoughts, I may not be anybody’s favourite person, that I can think of… but whether I am or not, it doesn’t really matter. My life is no less significant for it. And even I don’t know the impact I have made on others, as others don’t know the impact they have made on me. I guess the important thing is not to worry about if you’re somebody else’s favourite person or not… it’s to make sure you love those around you, regardless. Because y’know what? Love has no favourites.